The WISER programme of workshops for Michaelmas Term is now available on the Bodleian Libraries website at: http://www.bodleian.ox.ac.uk/wiser. There are a lot of useful hour-long sessions on finding resources and managing your research, all free and taking place at OUCS on Banbury Road. Throughout the term I will publish weekly updates of upcoming courses here on this blog. You can also subscribe to the WISER mailing list yourself (send an email to wiser-subscribe@maillist.ox.ac.uk), or keep up to date via the WISER blog or Twitter. The WISER blog also includes lots of extra information and tips about finding information, using resources, and managing your research, so is well worth a look! From Monday (4th October) we’ll revert to our normal opening hours: Monday-Friday, 9am-7pm. 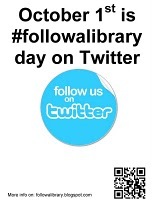 October 1st 2010 is Follow a Library Day on Twitter. The idea behind this project is to get Twitter users to tweet about their favourite libraries on 1st October, using the hashtag #followalibrary, in order to create a buzz and highlight the importance of libraries to people around the world. The Follow a Library project is also creating lists of libraries on Twitter, and the various Oxford libraries that tweet (including us) are being added to the UK list. If you use Twitter, join in on Friday, and don’t forget to follow the VHL @vhllib! We are offering tours of the VHL on Friday 24th September as part of the Oxford University Alumni Weekend. To accompany the Alumni tours, we have set up a small exhibition of various interesting things in the library, including some books from our stacks, a few items from our e-resources, and a selection of items from the Philip & Rosamund Davies US Elections Campaigns Archive. Feel free to drop in and have a look – the exhibition will be dismantled early next week. The wireless router at the VHL is currently out of action. This means that there is no access to either the Bodleian-Libraries or Eduroam networks until it is fixed, hopefully later today or tomorrow morning. As the RAI router is still working, wireless internet access is still available via OWL for anyone with VPN. UPDATE 23rd September: Full wireless access has now been restored. The Bodleian Libraries are developing an online set of guides to resources at libguides.bodleian.ox.ac.uk. As part of this, we are working on transferring all the information we previously had in the printed guides available in the library (US History Sources and US Government Publications) onto the LibGuides site. The History guides are still a work in progress, but the US Government Publications guide is now live and available for you to use. It aims to provide a portal to the many sources of publications and information produced by the US government, both historic and current, held here in the VHL (and elsewhere in Oxford) and online. We hope you’ll find it useful – please let us know if you have any feedback or suggestions for how it could be improved. You can access the guide via libguides.bodleian.ox.ac.uk, as well as through our website, or directly at http://ox.libguides.com/us-govpubs.